No matter which dining attractions you choose, you will be in for a delicious thrill ride through the wine country! The Napa Valley Food Scene continues to explode and amaze locals and visitors alike with the constant influx of new flavors and signature chefs opening up shop. It seems every day there is something new to delight in. With Napa Valley already having a stake in the ground as a premier “foodie” destination, it is taking on new heights on the path to notoriety of being one of the world’s signature and top culinary meccas and one of the largest food destinations spanning over 30 miles. Every little nook and hamlet in our valley can stake claim to having their own world-renowned chefs putting them on the map. Calistoga has exploded with two signature chefs opening their doors there with Angeline, and Johnny’s. A variety of new flavors have hit the dining tables with 3 new Japanese-Inspired restaurants that have recently laid ground or are coming soon to the Napa Valley with the recent opening of Miminashi and Two Birds one Stone, as well as the soon to be open Kenzo. The Latin theme brings an added flare with the opening of the Puerto Rican inspired restaurant Protea in Yountville, and the Brazilians got on board too with the opening of the Brazilian Steakhouse Galpao Gaucho in Napa. Sophisticated pub food or “gastropubs” are popping up on the scene as well offering an alternative to high end higher priced dining along with a broad selection of craft beers. The Corner brings more new life to the Riverfront dining scene in Napa. 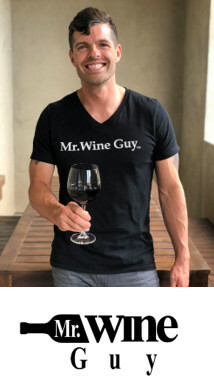 This new eatery is being coined as part gastropub and part wine shop, filling the 3000 sqft is a restaurant, lounge, bar and retail wine shop with 5,000 bottles focused mainly on France and Italy. Co-owners Trevor and Stephanie Sheehan have tapped into their own vintage collection to fill the shop. Executive Chef Dustin Falcon (Morimoto, Ad Hoc, The French Laundry) had developed inspired dishes for the opening menu including red chili braised port, pastrami short ribs, strip loin with cheddar grits and pan-roasted snapper with lobster ravioli. Grand opening slated for July 22nd. Serving dinner from the start and lunches to come soon. 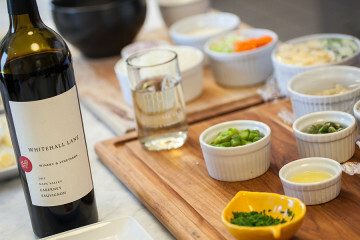 The culinary team created the “Sunday Supper” concept where the NINEBARK chefs host a more casual “family-style” presentation. The head chef at NINEBARK, Rex Huang felt the need to create a more casual fun dining experience for family, friends and visitors. With the support of the executive chef and partner, Matthew Lightner, the culinary team creates different menus every week for the Sunday Supper specials. The regular menu is not available on Sundays, instead diners hand themselves over to the chefs for a surprise and somewhat of an experimental meal. The menus are different every Sunday and is comprised of ingredients for the dishes that the chefs have been working on throughout the week, highlighting seasonal produce. You might expect dishes like Shrimp Ceviche; Romaine With Mackerel Vinaigrette and Black Pepper Brodo; tomato jam, horseradish cream and jalapeno jelly or a Pulled Pork and chicken pitas; or summer sundaes. It will surely surprise and amaze. Also offered is a large format beverage option, whether it is punch bowls, pitchers of cocktails, or Jeroboams of wine. The atmosphere is fun and inviting. $60 per person. Keep any eye out for their soon-to-be-launched new restaurant venture in Calistoga which will showcase the feel of an American Road trip vacation in the 50’s and 60’s, this will surely be lots of fun. In the old Pearl Location in Downtown Napa, another heavyweight restaurant is premiering soon by Japanese millionaire mogul and owner of Kenzo Estate wines in Napa, Kenzo Tsujimoto. Word on the street is it will be high-end Japanese cuisine and feature fish imported from the Tsukiji Fish Market in Tokyo. It will also include a tasting from for the Kenzo wine collections. Opening soon. The owners of Galpao Gaucho in San Antonio brought their authentic Brazilian restaurant to their newly added location in Napa off Highway 29 in the former Oventi/Marie Calendar location. 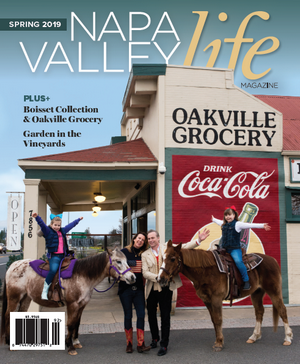 Business owner Alberto Wachholz and business partner Jovani Gava opened the first one in Texas in 2014 to great success and as a result decided to expand in to the Napa Valley. They were looking for a very unique place and one that did not already have Brazilian steakhouse nearby. Napa reminded Alberto of his hometown in Southern Brazil, Sobradinho, and thus the lure of the location. At these type of churrascarias as they are called in Brazil. The meat is butchered and prepared on site over grills. Galpao Gaucho’s menu includes over a dozen cuts of meat slow cooked over an open flame and then presented to the tables by traditional garbed gaucho chefs. The meat is sliced tableside. There are traditional side dishes and deserts as well. Lunch ranges $30 and Dinner $45. Husband and wife team, Morgan and Irma Robinson opened southside in the former Foothill Café location in South Napa, featuring a new coffee house and café. They are serving California cuisine with a Latin influence along with specialty coffees. The focus is on coffee, food, beer and wine. The menu focus is on market influenced ingredients and simple flavors. Lunch includes a classic Cuban sandwich and a faro salad with baby kale, roasted squash, golden raisins and capers. Keep an eye out for their Fried Chicken Days! They are open Mon – Sat for Breakfast and Lunch from 7am-3pm and Sundays 8am-3pm. Stone Brewing, one of the specialty beers most recognizable brands, founded in 1996 and is the 10th largest craft Brewer in the US. They are taking over the old Borreo building built in 1877 to be their Napa Valley Hub. The location at the corner of Soscol and First Street along the Napa River will offer the complete line of Stone’s signature beers and ales and will also offer other niche Napa Valley beers as well. Along with all of their beers on tap they will be offering a restaurant with indoor and outdoor seating along the riverfront. Though the final menu has not been completed yet, they may have a Mexican flare to the cuisine at the brewery. Stay tuned for more information coming on their opening. Hop Creek presents a Gastropub and Nanobrewery and welcomes everyone with top-notch friendly service, along with a family and pet-friendly atmosphere. Their menu is created by Head Chef Pedro Padilla who began his career in the food/beverage industry in 1991 hired as a prep cook at Red Hen Cantina. Finding his true passion he was mentored and self taught himself to be a great chef and leader. 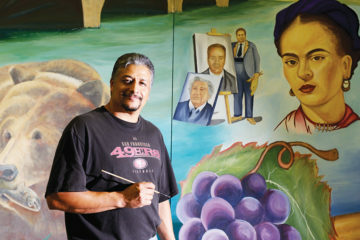 In 2006 he took a Head Chef position at Maya in Sonoma Square. Then in 2012 he returned to the Napa Valley at La Contessa then Cooks in St Helena. Pedro enjoys working with others, making guests happy by creating fresh quality meals guests enjoy. Pedro also takes pride in his work and makes our fresh flavors of house made cheese cakes. The Hop Creek menu offers a wide selection of tastes and flavors with a variety of crowd pleasers for everyone. The appetizers include to name a few, tasty pretzel bites, crispy calamari and don’t miss out on one of their pub burgers. For lighter fare they offer a great section of fresh salads. Their large selection of draft and bottle beers are diverse and sure to please all at the local’s watering hole in Browns Valley. Lots of big HDTV screens everywhere for game-day enjoyment. And on warm afternoons and evenings the back patio provides a relaxing environment to unwind after a long day. They are open everyday for lunch and dinner and weekends for Brunch too!!! Don’t miss out on their Happy Hour Monday through Friday 2pm to 6pm. For the first time ever, the FARM at The Carneros Inn will be presenting Sunday brunch. FARM invites guests to enjoy the summer Brunch season on their newly renovated patio and take in a round of bocce ball. Their family style brunch premiers in early July and will be offered every Sunday from 10am to 2pm. Executive Chef Aaron Meneghelli, created this elevated family-style brunch and will serve classic brunch with a Napa Valley spin. It will change weekly depending on the best local produce available. 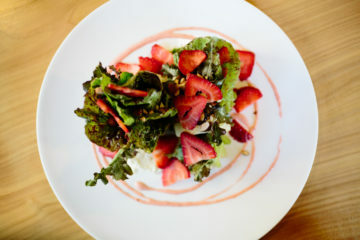 Brunch dishes will include Smoked Fried Chicken and Waffle, Beets and Berries, Fresh Biscuits with Silverado Trail Strawberries, foie gras mousse, and Marshall Farms honey, among others. 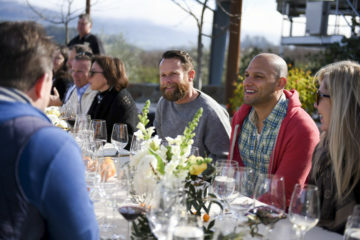 The Masters Winemaker Dinner Series: The Meritage Resort and Spa and Opus One recently created an exceptionally memorable experience for connoisseurs of exquisite wine, cuisine and music this June with their Opus One event. This special-six course dinner featured five rare vintages of Opus One wines, plus a private concert performed Clark Sterling and Susan Powers in the Entertainment Cave at the resort. These special event menus are inspired and created by Meritage Executive Chef Ryan Rupp who creatively pairs the evening’s courses with the featured winemakers wines. He is passionate about ensuring every dish that comes from the kitchen has the right mix of flavors and presentation, while utilizing as many local and sustainably raised ingredients as possible. He joined the Meritage team in 2015 and quickly became executive chef. Rupp now oversees all hotel food operations, including the signature Siena Restaurant, Crush Ultra Lounge, The Commons: A Wine Bar, Blend, banquets, and signature events including Masters and Makers @ Meritage, winemaker dinners, and special holiday brunches. The Masters Dinner Series evenings begin on the Meritage picturesque vineyard deck with a glass of wine from the featured winemaker’s selection and along with perfectly paired aperitifs as you enjoy the Napa Valley view, followed by multi-course dinner prepared by Meritage Chef Ryan Rupp in the Estate Cave where each delicious course is married beautifully with the evenings selected vintages by the featured winemaker. • Masters Tequila Dinner with Don Julio – July 29 6-9p: Live music will greet you as you step onto the Sienna Patio for a receptions featuring Don Julio. For more information on all of the amazing events at the Meritage go to their website and click Calendar for a list of the Meritage Collection Events. A Latin Inspired casual Eatery opens in Yountville – Daily-changing menu of Latin-inspired street food & comfort fare in cozy digs with outdoor seating. 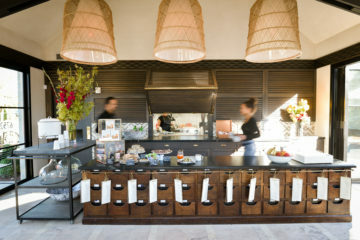 At Protea they change their menu daily to take advantage of the fresh products available in the Napa Valley. Though the base of their menu is Latin inspired flavors, you may find the occasional Ramen Stir Fry bowl on the menu. Chef Anita Cartagena loves to cook with chilies of all kinds. Protea’s location offers spectacular rooftop dining at their Yountville location where you will take in views of the mountains surrounding the valley and breathtaking sunsets. Chef Anita brings a wealth of experience to the table. She is particularly suited to take on the strict standards of a Michelin Star quality restaurant and translate it to a more casual, affordable atmosphere with hand crafted sandwiches, soups and salads. Protea is open everyday except Monday 11am to 8pm. Harvest Table, Charlie Palmers newest venture recently opened their full service restaurant and bar in this popular and posh St. Helena Inn. 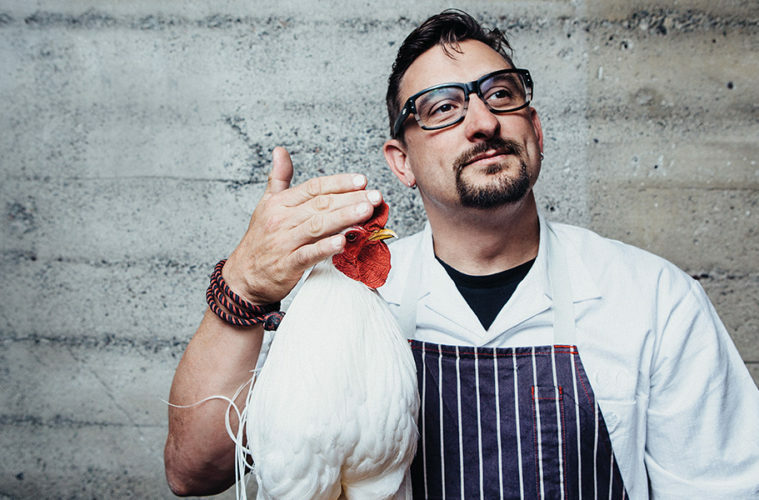 Charlie along with executive Chef Levi Mezick are focusing on “hyper-seasonal” and local ingredients supplied by the properties 5 culinary gardens that support the restaurant. The menu is divided into snacks starters, plates as well as a daily, family-style dish meant to share. Napa Classics headline the wine list along with smaller production up and comers. Harvest Table is open for lunch Wednesday to Friday from 11:30am – 2:30pm. And Dinner is served everyday but Mondays starting at 5:30p and Brunch is Saturday and Sunday 11a to 2:30p. They have expanded their restaurant operations into its signature restaurant with the return of their popular lunch service. The restaurant evokes a modern farmhouse feel with an intimate 60 seats. Lunch menu items include Melon and Arugula Salad, Rock Shrimp and Chorizo, Housemade Ricotta Ravioli, Garden Herb Tagliatelle as a few of their selections. The Restaurant at Meadowood team, led by their 3 Michelin-starred Chef Christopher Kostow and Director Daniel Dorn, plans to offer a “celebratory and casual dining experience.” Though the restaurants, The Charter Oak and The Restaurant and Meadowood, will be 2 separate entities they will be twined together by the team including Nathaniel – Meadowood’s front of the house director and Katianna Hong, Chef de cuisine along with a host of artisans. The Kitchen will ditch heavy sauces and techniques like sous vide and complicated garnishes in flavor of steam and fire. While dining, guests will also pour their own wine and choose bourbons and dessert from carts rolled through the dining room. Dishes will be rustic, but refined. With so many options for fine dining in Saint Helena, it is wonderful to have Kostow bring approachable and less formal dining to the neighborhood. Kostow stated, “ We want to create a casual place where locals, visitors and even our own families can come and enjoy any occasion.” They plan to open their doors in late summer. Brasswood located on the 50-acre Cairdean Estate Winery welcomed the former Tra Vigne sous chef as their chef and the General Manager from Tra Vigne, Jennifer Bohr along with many of their former crew to be the heart of this new St. Helena restaurant . The Cairdean Estate owners Edwin and Stacia Williams had the vision to refine and expand their market village with the opening of Brasswood Restaurant fulfilling their dream to making it into a place for locals and visitors to enjoy this beautiful valley. The food is an eclectic mix of old and new with a distinct Cal-Italian influence, “California Comfort Food.” They have mozzarella-stuffed risotto Aranchini, Dungeness Crab Cakes, Herb-Crusted Lamb Chops, or juicy, house-made rib-eye burgers. Their wine list is Napa focused and their spirits collection brings and extensive selection from around the world. The Brasswood Bar and Kitchen is open Wednesday through Sunday 12Noon to 9P. 311 St. Helena Hwy. N, St. Helena | 707-302-5101 | www.cairdeanestate.com. Chefs Sang Yoon and Douglas Keane pair up to bring their new restaurant to Saint Helena with California-inspired Yakitori Cuisine. It is the first collaboration between the two renowned chefs, the menu will feature poultry forward dishes, highlighting locally sourced products from regional wine country purveyors as well as an eclectic wine list, led by Master Sommelier Kevin Reilly (Quince, Cyrus). After five years of success at the helm of Eiko’s, Chef Jake Rand is excited to be teaming up with owners Keane and Yoon bringing a modern California interpretation of yakitori cuisine to Napa at Two Birds One Stone. The food is meant to be inspiring not challenging, centered around yakitori – skewered meats and vegetables, along with Japanese-inspired small plates, and fine-dining dishes like a foie gras parfait with cherry blossom gelée are all part of this refreshing new Napa Valley Dining experience. Dining will be in the newly remodeled 1800’s era stone building. The original stone is still the main focus, incorporating modern steel elements. The dining room offers 80 seats, with 35 seats on the outdoor patio, complete with its own yakitori grill. In true Napa style, fire pits and water fountains are part of the inspired outdoor seating area. San Yoon is also the chef and proprietor of Father’s office gastropub and Lukshon restaurant in Los Angeles. The “Office Burger” has been hailed as the country’s best burger by the TODAY Show and Esquire Magazine. He has been featured as a guest judge on Top Chef and Competing Chef on Top Chef Masters. Chef Douglas Keane, owned and operated his flagship restaurant, Cyrus, in Sonoma County for 8 years. For seven consecutive years he maintained both 2 stars from Michelin and 4 Stars from the SF Chronicle as well as a James Beard Award for Best Chef Pacific. His cooking style follows a simple Japanese philosophy, Shibumi, which means refined simplicity, simple elegance, unobtrusive beauty and quiet perfection. He has also appeared on Top Chef and Hell’s Kitchen as a judge and season 5 winner of Top Chef Masters. The Luxury Collection Hotels will be welcoming a new addition in the Napa Valley, with a luxury boutique hotel amongst the vineyards adjacent to the renowned and majestic Beringer Vineyards and Estate. This intimate 68-room hotel will also be offering a signature restaurant by acclaimed Chef Chris Cosentino, chef and co-owner of San Francisco’s Cockscomb and the chef & co-creator of Boccalone artisanal sulumeria. Cosentino has appeared on Food Network’s “Next Iron Chef America”, “Chef’s vs. City” and Bravo’s “Top Chef Masters” as the season 4 winner. The restaurant will be called the Acacia house and will be led by Cosentino and business partner Oliver Wharton. The Acacia house is the buildings original name and dates back to 1907. It will reflect the rustic and bustling atmosphere of the former inn with updated modern elements to showcase Cosentino’s renowned combination of bold and balanced flavors. Acacia’s menu will capture the seasonal sensibility of California’s wine country with a selection of small and large plates. Slated to open this Fall. Keep an eye out for new updates on the new hotel and restaurant opening. Recently opened this Spring, Johnny’s brings new life in to the restaurant at the historic Mount View Hotel. Johnny Ghisolfo opened the original Johnny’s in the 1920’s. It’s name “Johnny’s” pays tribute to the original community leader that revives his namesake, while bringing Calistogan’s a new place to hang out. The bar side is always lively and the place to be with five HDTV’s during playoffs games. It was standing room only during the recent Warriors final. They recently launched their new Charcuterie & Oyster Bar on “table side”. Michael Dunsford, co-owner of the Calistoga Inn, along with their executive chef Nicolas Montanez, collaboratively opened this new hot spot as a newly revived local hangout. Dunsford said, “When guests walk in we want them to feel welcome and have a great experience by comfortably enjoying great food, wine and beer.” James Richmond, the former executive chef at Bistro Jeanty in Yountville manages the day-to-day kitchen as the Chef de Cuisine. Richmond suggests a must-have dinner item is the Creekstone beef filet with horseradish potatoes and oak roasted mushroom sauce. On the lighter, more casual side be sure and try the sliders. But don’t miss their breakfast either at bar-side. Well worth the drive up to Calistoga. Chef Brandon Sharp known for his inspired cuisine for the last eight years at Solbar in the Solage Resort has taken his distinctive California cuisine to the recently opened Evangaline. His new vision, of course is backed by the owners of Solage and that is not surprise. Brandon Sharp is a visionary when it comes to creative cuisine. He has a magic touch when it comes to fried food, which of course is not a surprise, with his southern background. He incorporates his southern New Orleans style into the diverse mix of flavors. The corn meal crusted soft shell crab po’boy is a crowd pleasure. If you happen to be dining on a Sunday, don’t miss out trying the Gumbo Ya-ya. The expansive 90-seat airy patio is where most of the action is. The diverse menu is a selection of Premiers, Appetizers, Entrees and Complements that include dirty rice and grilled Andouille sausage. Seafood is featured in five of the dishes such as the grilled Salmon with a summery flare and chicory salad with Juju apples. Check out their website for an extensive menu sampling. www.evangelinenapa.com.Angeline is a Bistro of French Creole Fare served in a cozy polished interior. It is a patio restaurant where indoor seating is limited. Open for dinner at 5:30 and weekends for Brunch too.